The eMMC memory device is standard form of embedded NAND Flash in all Smartphone, Table, Chromebook and many other portable or stationary consumer electronics. 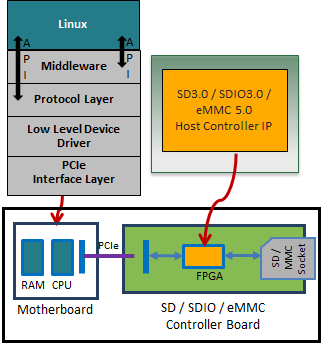 Designed to be cost effective and Linux based, this eMMC 5.1 hardware validation platform (HVP) consists of Arasan’s eMMC 5.1 IP mapped into FPGA’s, offering full speed physical connectivity to a complementary SoC host or memory card device. 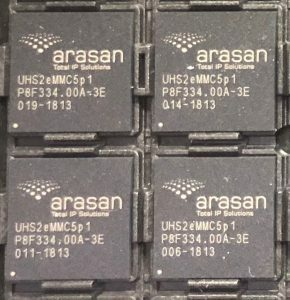 Arasan’s active participation in the JEDEC/eMMC standards bodies and early customer engagement has made Arasan’s eMMC controller IP a reference in the industry. An equally important part of the eMMC 5.1 HVP is the software stack, which abstracts all the low level software drivers and hardware to a loadable shared object with easy to use API’s. Hence, an applications software, validation or systems engineer does not need to delve into the protocol and signaling details, and considers the Arasan platform as a programmable complementary device. The eMMC 5.1 HVP can be used by system developers, system integrator, software developers and system quality analysts to debug as well as validate their products during the product life-cycle.